fishtailair – Summit Helicopters Pvt. Ltd. Under the command of Capt. 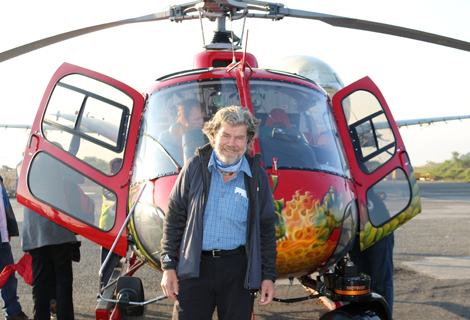 Maurizio Folini, Reinhold Messner flew with Fishtail Air’s helicopter on 29th and 2nd November. 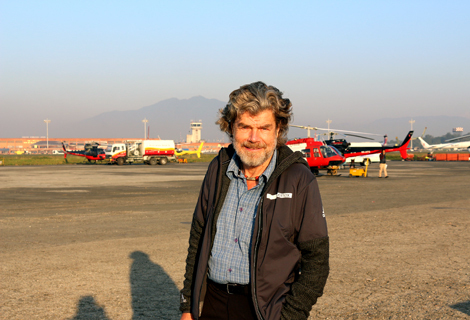 72 year old Messner, is from Italy and is well known mountaineer, adventurer, author as well as explorer. He initiated his mission climbing Mount Everest without supplemental oxygen. He had been visiting to Nepal since early 1970s, and had successfully climbed Manaslu, Mount Everst, K2, Kanchanjunga, Annapurna, Dhaulagiri, Makalu, Lhotse and several other peaks. It won’t be huge mistake if we regard Messner a living legend in the world of Mountaineering. Also well known as MEP for Italian Green Party in 1999, he was founder of Messner Moutain Museum. He is well known writer for sharing his experience, as he has published 60 books till date. Currently he is engaged in shooting documentary in Nepal for German Production House. Apart from promoting Nepal’s tourism sector, the documentary is expected to glow Nepalese mountains further as well. His involvement in this project was duly supported by Fishtail Air. These two days of flight through Fishtail Air helped German Production House in collecting scenic beauty of Mountains in Eastern Nepal.